Pulitzer Prize winning playwright (Men in White) Sidney Kingsley’s Dead End was a Broadway triumph in 1935-37 seasons running for 687 performances. Producer Samuel Goldwyn paid $165,000 for the film rights and the screenplay was adapted by Lillian Hellman. 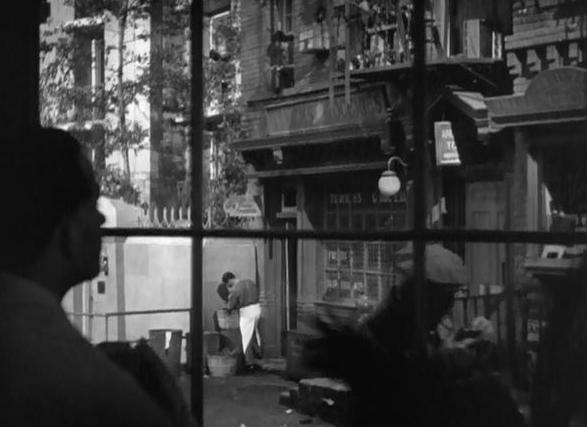 There could only be one director for Goldwyn to bring so vividly to the screen the story of one day in a New York City slum when everything would change and everything would stay the same, William Wyler. 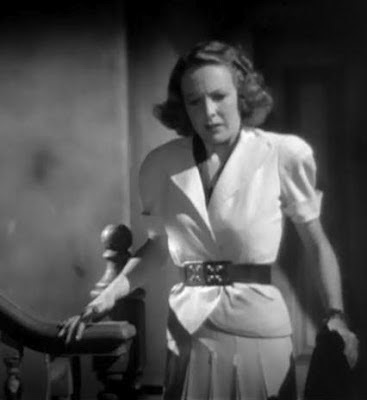 The distinguished Goldwyn-Wyler collaboration began the previous year with These Three the adaptation of Lillian Hellman’s The Children’s Hour. No matter the legendary clashes between Goldwyn and Wyler of personality or vision, the independent producer was driven to the highest standards of quality and quality is the hallmark of a William Wyler film. Early consideration was given to filming Dead End on location in New York and while that would have given audiences a most interesting time capsule of the moment, it would have denied us the exquisitely intricate set from Oscar winner (for Whoopee!, The Black Angel, Dodsworth, This Above Hall, How Green Was My Valley, A Streetcar Named Desire, On the Waterfront) Richard Day. 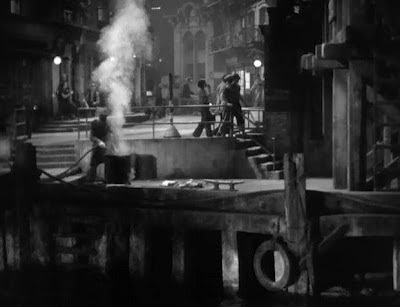 Among the narrow streets, sudden alleyways, rickety docks and grimy tenements huddled beside a gleaming, luxurious apartment complex lives are played out for us. Lives trapped in a dead end by circumstance, environment and character. Wyler and his collaborator, the incomparable cinematographer Gregg Toland, take us to a dead end where darkness illuminates and sunshine is harsh. We get to know the kids on the street, the bad boys from destitute and abusive homes, the boys with no prospects and poor role models. The youngsters are played by the original Broadway cast members and became known as the “Dead End Kids”. Many will remain familiar faces to audiences under different guises as The East Side Kids and The Bowery Boys. When they hit Hollywood with this film the out-of-control youths amused themselves in the boys will be boys vein which led Goldwyn to sell their contract to Warner Brothers. After two years in the play the young actors had honed their archetypal characters to their essence. The natural leader Tommy (Billy Halop), anxious to keep his position and about to outgrow his sister’s guidance. “T.B.”, who’s been to reform school and knows a thing or two. He has no fear. What does he have to be afraid of, he has tuberculosis. Sweet-faced Angel (Bobby Jordan) who already knows you have to look out for number one. Shifty “Spit” (Leo Gorcey) who talks a big game but is a frightened boy inside. “Dippy” (Huntz Hall) who survives with his own brand of humor and Milty, the new kid on the block who wants to fit in, who has to fit in. The generation prior to this gang of kids is represented by Dave (Joel McCrea) and “Baby Face” Martin (Humphrey Bogart). Dave has struggled for years to become an architect thinking that education and a career are the way out, but there’s a Depression and jobs, even for the right kind of people are hard to come by. Yet it is not in Dave’s character to lose hope nor to give up on the neighborhood kids. Whether they know it or not, want it or not, he is their protector. McCrea plays Dave with a sincerity and an honest manliness that makes him believable in the midst of misery. On the other hand, “Baby Face” is a success. He’s one of the most wanted gangsters in the country, known to have killed at least eight men. Martin found a way out so why is he back? The money and how he got it weighs on Martin. He’s looking for his innocence lost so long ago on this dead end. He won’t find it from his mother (Marjorie Main from the original Broadway cast) or from his first sweetheart (Clair Trevor). Each disappointment breaks Martin’s already mangled soul and makes him a meaner man. Heartbreak and bitter resolve are etched on his craggy face. Humphrey Bogart seemed to spend the 1930s proving his acting worth over and over again. “Baby Face” Martin is one of his greatest achievements. Women live on this block. Tommy’s sister Drina (Sylvia Sidney) is here, but she’s not living as she wants. She’s working for a better, cleaner someday for herself and her brother. She’s on strike with fellow department store employees for better working conditions. We see the good girl that Drina works so hard to be crumble in the face of fear for her brother and her poignant gushing forth of a long held girlish daydream of someone to take her way from all this. Drina really wants Dave, but sadly sees his affection going toward Kay (Wendy Barrie). Kay is part of the rich crowd that parties on their terraces that overlook the slums. Road repairs are forcing the classes to mingle uncomfortably. Kay already straddles both worlds as an attractive girl from humble circumstances who has accepted the protection of a wealthy man. Love doesn’t enter into the relationship, only a well-founded fear of poverty. Love, or something like it, is something Kay thinks she can have with Dave for a little while. Although they don’t know each other, they would understand each other as Drina is coming to realize maybe you only get happiness, if you get it, for a little while. Dave is still looking for always. Francie thought she had found a way out or maybe she just gave in. “Baby Face’s” teenage sweetheart has had it rough since he left for the big time. She is a sick pathetic prostitute. 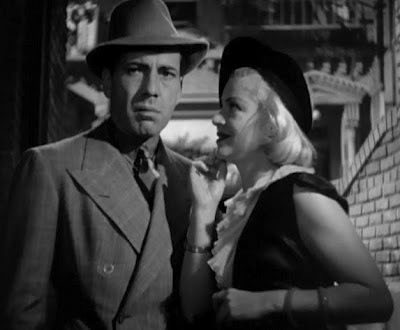 Claire Trevor’s one scene in Dead End earned her a most deserved Oscar nomination in the supporting category. Unexpectedly face-to-face with her first love and his condemnation, we see the girl that was and the hustler she had to become, and we never forget Francie. There are older women here on this block. Marjorie Main as Mrs. Martin carrying the burden of a son gone wrong like a ball and chain. Esther Dale as a slatternly busy-body not above stealing candy from a baby. Fast forward a few years and these ladies become perfect comic foils as Ma Kettle and Birdie Hicks in the popular Ma and Pa Kettle series. Dave’s mother played by Elisabeth Risdon retains a sweetness despite her surroundings. Caftan Woman favourite Esther Howard has a bit as a sassy tenement resident, although I like to think of it as a cameo. There are other men here as well and we know them by the expertise of their players. Allen Jenkins is Martin’s loyal and pragmatic partner in crime. James Burke as the cop who is no brighter than he needs to be. 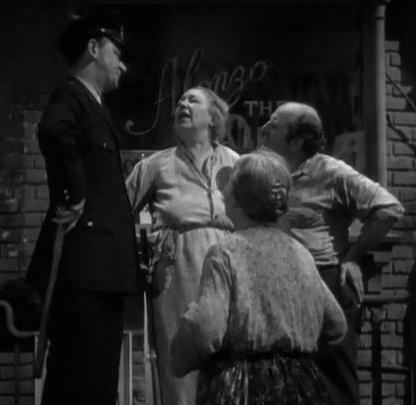 Ward Bond as the officious doorman. A lackey to the rich who sees himself as someone with a position. Minor Watson as a monied man whose twit of a son was in more danger than just a beating by neighborhood toughs. A man who believes himself to be fair, but cannot see beyond theories to living and breathing humanity. William Wyler was a director of great taste and judgment who appreciated the written word. However, he was not able to articulate to his actors precisely what he wanted from them in any given scene. 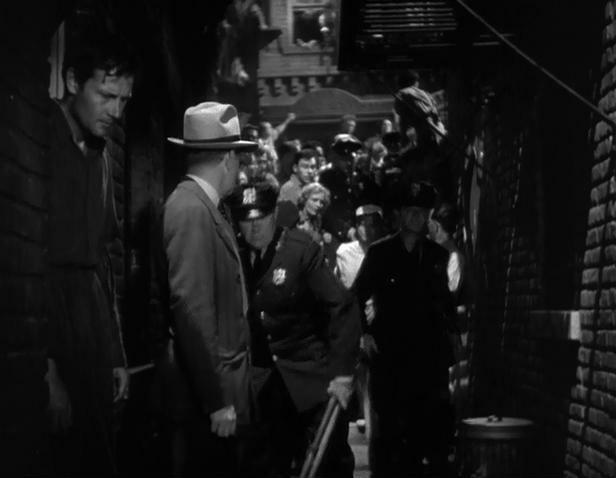 Wyler’s “method” would be multiple takes until the actor was worn down to giving what Wyler felt was the reality in the scene. Speaking about the legend of the takes, William Wyler laughed “I make maybe 6, 8 takes and it turns out to be 40. Ha! It’s true that I would make as many takes as were necessary to get the scene – to get it good”. R.D. 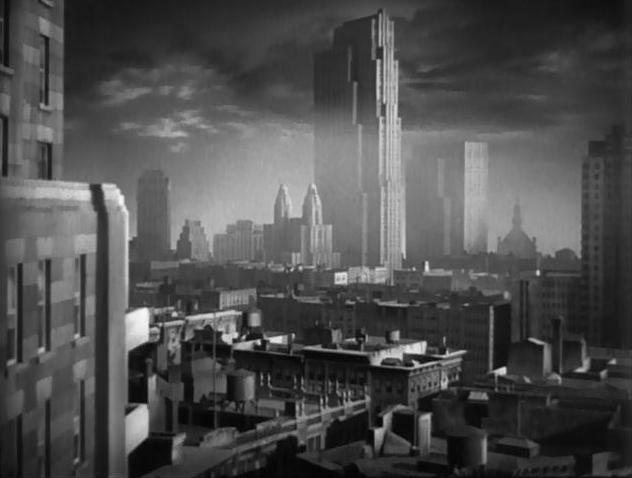 Finch, The Movie Projector hosts the William Wyler Blogathon June 24 – June 29 where you will find many excellent articles on exceptional films. Thanks for such a lovely post on this great film. You really show how Wyler emphasized his characters in his movies, showing them in all their humanity. 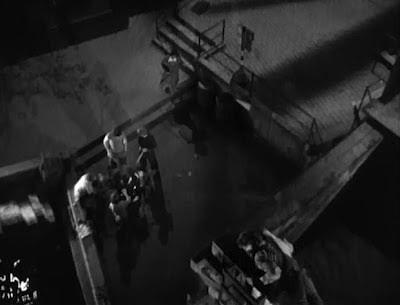 Toland's cinematography really gives us a sense of the lives these people inhabit and what shapes and influences them. And I like your comment about Marjorie Main and Esther Dale later teaming in the Kettle pictures for comedy! Main is only in a few scenes in 'Dead End,' but she's so brilliant, conveying her despair and hopelessness; her scene with Humphrey Bogart is the most memorable in the film. She really had acting chops! This has always been a movie that I have wanted to see, and yet I have never found it. I am a huge Wyler fan and there are so many actors that I love in this movie as well. Your review sounds even better than I would have expected, and I hope I get to see it soon . 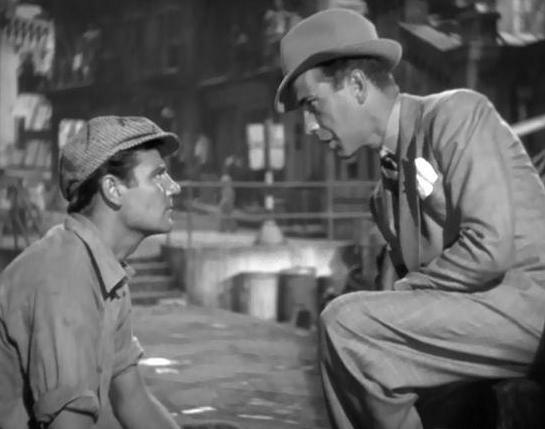 Bogart did not like working with Wyler, but it was because of his work with him in this film that he finally started to getting more recognition for his acting. Nice post, CW. In this, and "The Little Foxes" Wyler shows how effective he was in transplanting plays to the movie screen. I never felt I was watching a play. Oddly, I recently watched "The Desperate Hours" and thought it was too opened-up. 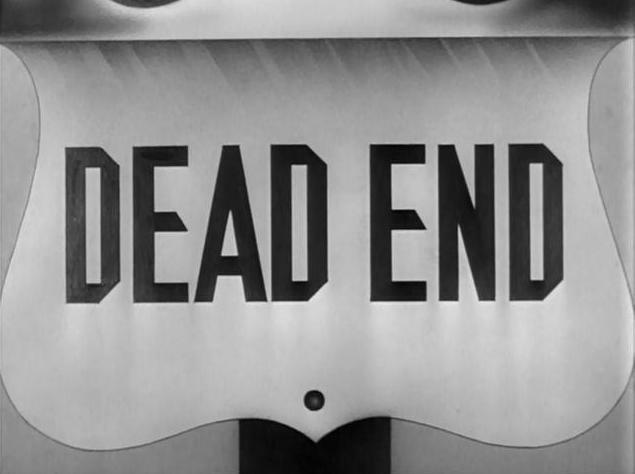 "Dead End" would make a neat double feature with "Angels with Dirty Faces". 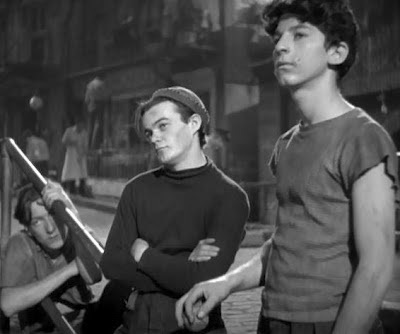 In both films, neighborhood heroes, hoodlums, have a very different effect on the boy's lives. GrandOldMoves, there is a non-judgmental empathy for all of the characters in "Dead End". I think it's a fascinating film full of wonderful performances that gets better in time. Birdie Hicks would NEVER look so untidy! Lasso the Movies, I too hope you get to see "Dead End" soon. It was the first time my daughter ever saw Humphrey Bogart and it made her a fan for life. Isn't it the way, Kim? Bogie may not have enjoyed the process of working with Wyler and making the film, but he certainly can't argue with the role it played in his career. I can do that, Kevin. I can have a "Dead End"/"Angels With Dirty Faces" double bill thanks to my combination VHS/DVD player. I love the fact that we can see some of the really great plays in the movies, especially when done in the spirit of appreciation that William Wyler brought to the adaptions. Very nice post on a great film. Goldwyn and Wyler were a dynamic duo - both men of great taste who did not put their personalities on display. Thank you, FlickChick. Sometimes the right people come together and do good work, and we benefit. A very thoughtful post on the movie and its interesting characters. I've never seen it, but I'm going to watch for it! Great insights, and great writing from you, as usual, on this pivotal film. Wyler and Toland strike again. Kevin's remark above on Wyler's ability to translate plays in such an excellent manner is well taken. I think of "The Heiress" as a fine example of this. A wonderful post on one of mt favorite Wyler films. While the set design was amazing I do wish they could have filmed it in NY. It would have lent a touch of realism to it all. Just my opinion. Toland's cinematography adds a lot and the acting is perfect and Bogart is Bogart, what could be better. Excellent post! CW, wonderful post about one of my favorite Wyler films and certainly among his most influential. Having just written about DETECTIVE STORY, I now know that Wyler adapted two Sidney Kingsley Broadway plays! Caftan Woman, a post that clearly shows your tremendous enthusiasm for this film and the lengths you were willing to go to do it justice. I'm pleased you picked it for your contribution to the Wyler blogathon. 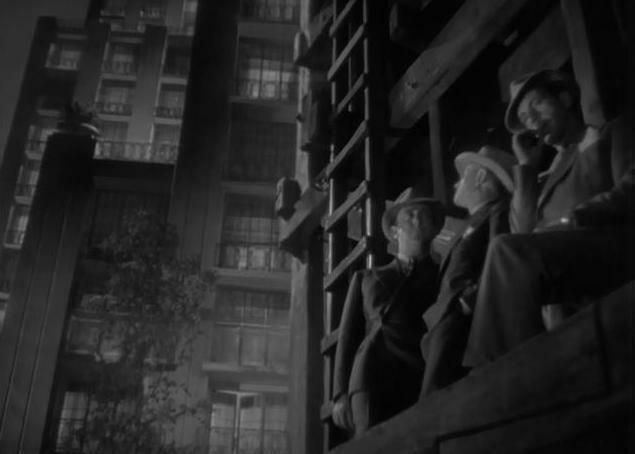 I particularly liked the space you devoted to that great set and DP Toland's photography of it. I know that Wyler wanted a more realistic, outdoor setting, but I agree that the wonderfully stylized set is almost hyper-realistic in its effect. 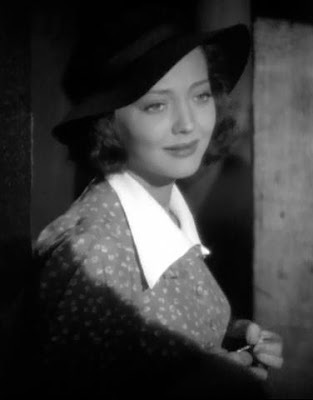 One of my favorite things about the movie is Sylvia Sidney. She's one of the great and greatly neglected American actresses of the 1930s. 1937 was a tremendous year for great performances by actresses--one of the two or three best ever, I think--and she gave two dynamite performances that year, here and in Fritz Lang's "You Only Live Once." Wyler, free of any studio to direct where and what he wanted was the best thing that ever happen to us, the audience. Whenever I read or hear Bogart referred to as "Babyface" I have to laugh. Yeah right! But anyway, perfect casting in every role. I'm such a big fan of Sylvia Sidney's anyway but I really enjoyed her performance under the direction of Wyler. You've done such a beautiful job here on letting anyone who hasn't had the chance to see this one want to rush out and find it. Shot so cleverly as you've shown with your perfect choice of screen shots and I enjoyed the back story on how Dead End came to be. Some things just seem to fall together so effortlessly like getting to purchase a successful screenplay, get Hellman to adapt it then the icing is Wyler saying yes. A wonderful contribution to the Wyler Blogathon. Fabulous overview of a film I know I must have seen but simply can't remember. Maybe I'll watch it again. Enjoyed reading your take on it, naturally. I really like this film and you do it justice. Even though some complain that Goldwyn wouldn't allow the set to be dirty enough, Wyler once again uses human emotion to convey what's going on so well that you don't need the grime. The intricate set itself, like you mentioned, is a marvel! Great post Caftan Woman. Dead End has a gteat ensemble cast, and as you point out, the sets were wonderfully done. They sort of have that stage set feel to them, which enhances the film rather than detracts from it. Thanks for your very thorough and enlightening post. I've been wanting to see this film for awhile and your excellent post is enough to make me bump it to the top of my list. I like Esther Howard too, such a great character actress. And I love all the screencaps you have, they really capture that trapped, claustrophobic atmosphere you describe. 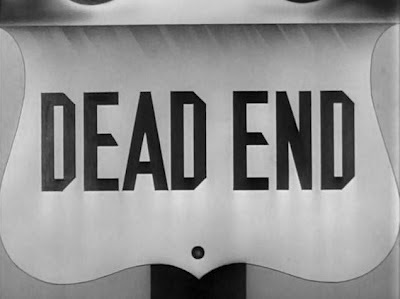 Thank you all for your kind words about my post on "Dead End" and sharing your thoughts on this excellent Wyler film. For those of you who now have it on your "must-see" lists - enjoy! "Dead End," like all the best of William Wyler's films, satisfies with many viewings. A fascinating tale, beautifully constructed and filmed (no mystery why Wyler preferred Gregg Toland) - plus an amazing cast (a shout out to Joel McCrea). I never tire of this one. Well done. I feel the same way, Lady Eve. I can't imagine a time when I will ever tire of watching "Dead End". Thanks a lot, Judy. I have no doubt that "Dead End" will live up to your expectations. Thank you, Dawn. It is surprising to me that the play, although popular in regional and community theatre, has never had a Broadway revival - and no one was tried to musicalize it. As you say, it's all there! Outstanding post, CW. All I can say is -- I am going to dig out my VHS copy of Dead End and watch it again right now. PS: My copy is a DVD bought at a second-hand shop for $4. Bargain!